The COOLPIX B500 feels great in your hands, whether you're zooming in with its super telephoto NIKKOR glass lens or recording 1080p Full HD video using the flip-up LCD. And it takes all the work out of shooting beautiful photos and videos with its 16 megapixel low-light sensor, Lens-Shift Vibration Reduction (VR), easy menus and controls, fun creative effects and outstanding automatic operation. Plus, the whole time you're shooting, the COOLPIX B500 can be easily and seamlessly connected to a compatible smartphone through Bluetooth® low energy (BLE) technology for instant photo sharing and remote camera control. Simply brilliant. Few shots are too far away for the COOLPIX B500's NIKKOR ED glass lens. 40x optical zoom gives you super telephoto power, then Dynamic Fine Zoom, an enhanced digital zoom, effectively doubles that reach for a whopping 80x zoom. Lens-Shift Vibration Reduction (VR) keeps your shots steady—crucial at such long distances—and a 16-megapixel backside illuminated CMOS sensor captures every detail. Install Nikon's new SnapBridge app on a compatible smartphone or tablet* and unlock exciting new capabilities with the COOLPIX B500. Built-in Wi-Fi®, NFC and Bluetooth® low energy (BLE) maintain a constant connection between the app and your camera, so each shot you take automatically transfers to your smartphone or tablet for sharing, editing with photo apps or uploading to your favorite sites. You can even use the SnapBridge app to control your camera remotely! The COOLPIX B500's large, tilting LCD display makes it easy to compose your shots and monitor your video recording. You can also use it to find exciting new shooting angles. Reviewing and sharing your creations is a pleasure, too—every shot and video looks fantastic on the high resolution display. The COOLPIX B500 is so easy to use, anyone can take great photos and videos with it. Just turn the camera on, point, shoot and marvel at the results. For maximum point-and-shoot convenience, select Easy Auto Mode. It automatically optimizes the camera settings for each shot, no matter how challenging the situation. You'll be free to enjoy the moment while you capture it. The COOLPIX B500 is a powerful video camera, too. Capture moments in Full HD 1080p quality with stereo sound and marvel at how 4-Axis Hybrid Vibration Reduction (VR) counteracts shaky hands for tripod-steady videos. Transform a regular video into a thrilling fast-motion sequence with the new Superlapse Movie feature, great for first-person perspectives, sports moments, video tours and more. When shooting photos, Lens-Shift Vibration Reduction (VR) counteracts the smallest movements for sharper, clearer photos. When recording video, 4-Axis Hybrid VR offsets up/down, left/right, in/out and even tilting movements for remarkably steady videos, even if you're walking or riding in a car. Easily match your situation to one of 18 Scene Modes like Beach, Snow, Night Portrait, Sunset and more, and enjoy effortless great shots. Or, choose Easy Auto Mode and let the camera choose for you. It's frustrating when a smartphone camera focuses on the wrong thing. With the COOLPIX B500, Target Finding AF quickly determines your intended subject and puts the focus where it belongs—on your subject. The COOLPIX B500 is so energy efficient, you can take up to 600 shots on four regular AA alkaline batteries. Capture an entire vacation—and then some—on just one set of batteries. Easily create artistic high-impact photos with the new Creative Mode. Select from five professionally developed presets that combine options like aperture, contrast and color reproduction for stunning results. Preview the effects before you shoot or capture one image all five ways and pick your favorite. A Nikon technology that improves image stability by automatically compensating for camera shake. Maximum high ISO available on the camera is 6400 ISO. Complementary metal-oxide semiconductor, one of the two main types of image sensors used in digital cameras. The Nikon COOLPIX CMOS image sensor with a backside illumination structure increases the amount of light that each pixel receives. The resulting improvement in noise and sensitivity reduction makes the select COOLPIX cameras more capable when shooting night scenes or in dark indoor situations. This innovative technology improves screen visibility for a more vivid, clear image when taking and sharing pictures. Reflections are minimized while contrast and power savings are improved. (In select COOLPIX models). Nikon’s Smart Portrait System incorporates into COOLPIX cameras a series of automatic functions, including In-Camera Red-Eye Fix™, Improved Face-Priority AF, Face Priority AE, Smile Mode, Blink Warning, Skin Softening and D-Lighting. 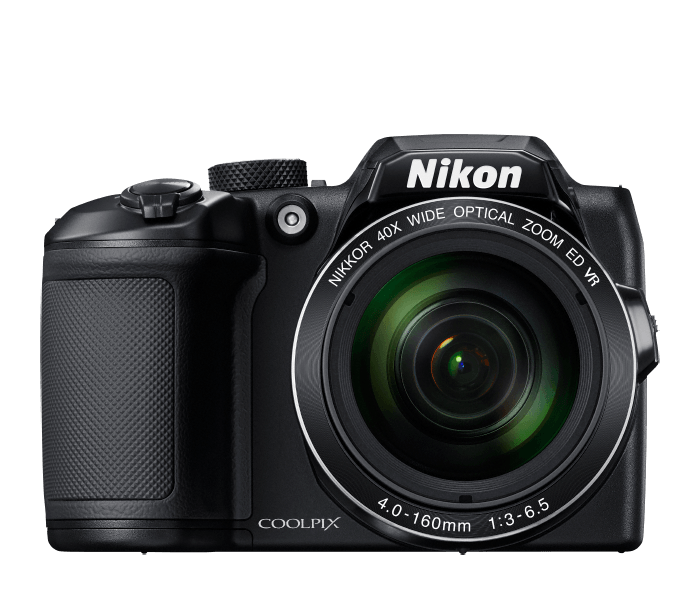 Nikon COOLPIX cameras are so smart they know what kind of picture you're taking and can automatically select from six commonly used scene modes, eliminating the mode-setting procedure and streamlining the shooting process. Select COOLPIX digital cameras utilize the Target Finding AF feature which instantaneously assesses the intended subject and automatically adjusts the AF area according to its size to assure clearly focused images. COOLPIX cameras and select D-SLRs in Live View mode, maintain focus on a moving subject using a contrast detection system, which is based on the principle that objects in a scene that are in focus display the highest contrast. Full HD video offers a resolution of 1080p, with an aspect ratio of 16:9. Refers to wireless technology and wireless communication. In photography, it's most commonly the wireless transmission of images directly from a camera to a computer in order to achieve a swifter workflow. NFC (Near Field Communication) allows cameras that feature NFC and select Android smartphones to connect by being in close proximity to each other. Dynamic Fine Zoom is a new feature available on select Nikon COOLPIX digital cameras that extends the zoom range electronically 2x with minimal image degradation.